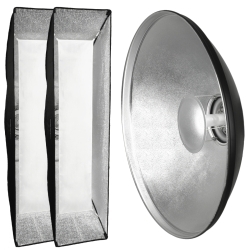 The high-quality Striplight with 40x180cm is the ideal assistant for soft and even illumination. 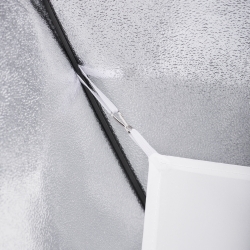 Whenever you want to achieve the most-possible glare-proof lighting, this Striplight is the right tool. Thanks to its innovative technique, it is easy to assemble in a few steps. Furthermore, it can be rotated around 360° with little effort. The rear diffuser, which is also included, can be used optionally as to make the light softer. The front and rear diffuser are easy to remove by means of Velcro fastener or rubber strap. 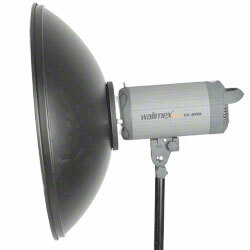 The walimex Beauty Dish is a highlight in portrait and beauty photography. 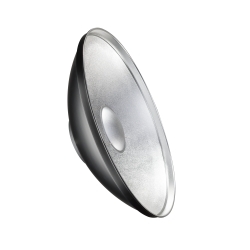 It provides a round, natural lighting of the eyes. 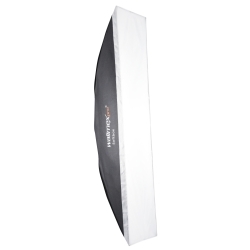 Concerning the hardness of the light, it closes the gap between a softbox and a standard reflector. 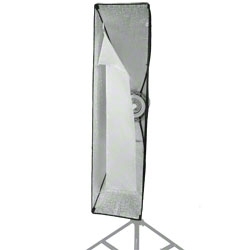 With its universal connection, the Beauty Dish is suitable for almost every flash system. 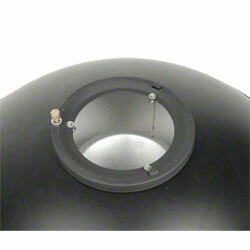 You simply need to order the suitable softbox adapter, which is optionally available. The use of different flash systems or change of your flash system is no problem anymore in future: just change the adapter and you can go on using your Beauty Dish. 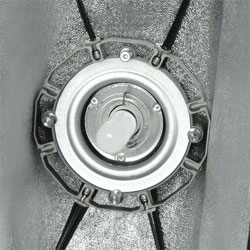 You can certainly find the suitable adapter in our assortment.